One of the best views of city! You have to climb up big hills to reach this location, but once you do, you'll be rewarded with a 360 degree view of San Francisco. A great place to bring a special someone. Or, if you're in need of some peace and quiet, stand at the top of the rock there and you'll be amazed! 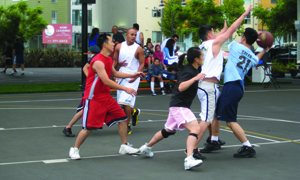 The Lakeview-Ashton Mini Park is owned by the San Francisco Recreation and Park Department. There are many ways to access the Park. This mini park is at the top of big hills (especially Orizaba Ave), so be careful when parking, and remember to turn your wheels! -- Garfield and Bright Streets, walk south one block on Bright to Shields, go left (east) to the park. -- Grafton* and Jules Avenues, walk south one block on Jules to Lakeview Ave, then go right (west) on Lakeview to the park. *Garfield becomes Grafton at Orizaba Avenue.